I am on an alkaline diet and I drink about 3 or 4 juiced lemons in my water daily. I'm wondering if adding the lemon rind zest with the lemon juice would be beneficial. I am glad to hear you are pursuing an alkaline diet. As I am sure you know, it is an important step in creating an environment in the body for optimal health and disease prevention. I am grateful you asked this question because I have wanted to write about the health benefits of lemon rind for a while . . . In short, even though I know there are many nutrients found in the lemon rind, I have some reservations about ingesting it. Thus, instinctively, I do not add lemon zest to my lemon water, but I do add small amounts to foods for the flavor and added nutritional benefits. I also suspect that the lemon zest is more digestible when taken along with whole foods or fresh whole food juices rather than just water or lemon water. However, I don’t know this for a fact. For further explanation, I will share some of the known nutritional benefits of lemon rinds, some possible concerns, as well as some thoughts as to why I don’t add it to my lemon water. What Exactly Is Lemon Rind Zest? The rind or peel of the lemon refers to the entire skin, including the outer yellow part as well as the inner white part of the skin, which is called the pith. The zest is the yellow part of the skin and contains many essential oils that give a strong, pleasant citrus flavor. The lemon peel pith has a bitter flavor that is unpleasant. The lemon rind (citrus limonum) contains many essential vitamins, minerals, and enzymes that are beneficial to overall health. Some of the key nutrients found in lemon rinds (the entire skin) are vitamin C, calcium, potassium, and citrus bioflavonoids (short term for bioactive flavonoids). The citrus bioflavonoids are likely the most important phytonutrients in lemon rinds. Clinical studies have revealed that lemon bioflavonoids have a powerful anti-inflammatory effect in the body, which improves blood flow and oxygenation to the tissues. Vitamin C is a potent antioxidant that, according to the “Prescription for Nutritional Healing” is responsible for over 300 metabolic functions in the body! The interesting thing is that the nutrients that are needed for vitamin C absorption in the body are bioflavonoids, calcium and potassium – the very nutrients that are in both the lemon fruit and peel. According to Dr. David Jockers at NaturalNews.com, hesperidin is a bioflavonoid found most abundantly in the peel and membranous parts of lemons and oranges and is often used for treatment of varicose veins and hemorrhoids. Two of the most potent antioxidant bioflavonoids found in lemon rinds are quercetin and rutin. These nutrients are also effective at reducing inflammation and protecting the cells and tissue of the capillary system from oxidative stress. One study indicates that lemons contain over 20 anti-cancer compounds which can prevent the growth and reproduction of cancer cells. 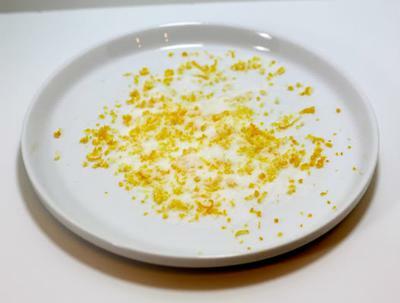 Many of these compounds are found in the lemon rind. Please note that all of these benefits are attribute to the rind (the entire skin, including the inner white part and the outer yellow part). In my nutrition studies over the years, I learned that the most nutritious part of many fruits is the inner part of the skin. In the lemon, that would be the pith, the white, unpleasant tasting part. I have not been able to confirm if this is, in fact, true for lemons and I have spent some time researching. Thus, I am not sure how much of the nutrient profile for lemon rinds is actually in the zest. If anyone can provide us with that information, please share it here. With all of these health benefits, and probably many more, why not add lemon zest to your lemon water? First, I would not recommend ingesting lemon rind zest at all unless the lemons are organic and preferably locally grown. Commercial lemons are often treated with pesticides, fungicides and dyes, and since these chemicals are oil-based, they will NOT wash off with water or most produce-cleansing products. In addition, to protect the lemon peels from getting damaged when transporting from city to city, they are often coated with a special wax. Lemons are most nutritious when they are fully ripe when picked. They also lose nutrient value the longer they are off the tree. Once a lemon is cut or peeled, it will start to oxidize and also lose significant nutrient value within a few days. When ingested, the oils in lemon rinds may also cause skin sensitivity to sunlight and have mild addictive properties. My biggest concern with ingesting too much lemon rind, however, is the fact that the rind contains high levels of oxalates, which are found in humans and plants in varying levels. High levels of oxalates are associated with certain types of crystallized stones in the body, such as kidney and gall bladder stones. Even though lemon rinds are supposed to be an edible form of fiber, I am not all that convinced that the rubbery, yellow part of the peel is readily digested and absorbed. I believe it is more digestible when taken with food rather than adding to water because your body will naturally produce more digestive enzymes for the food. Overall, eating lemon rinds is considered safe but should be done in moderation and discontinued if you experience any discomfort. I will also continue to add small amounts of lemon zest to many recipes for soup, fish, sauces, or salad dressings. You can make lemon zest using a zester tool or a cheese grater. When grating the zest of a lemon, I like to grate the whole thing, even if I intend to use a small amount. You can put the extra zest in an airtight container and keep it in the freezer. Again, you will lose some of the nutrient value but not the flavor. If I add lemon to a whole food drink that I make in my Vitamix juicer, I will put the whole peeled lemon in the mix, including the pith, along with a very small amount of zest. You can also do the same with a smaller, powerful mixer such as a NutriBullet mini juicer. I hope this information helps somewhat in your decision about what to do with lemon rind zest! P.S. I don’t know how long you are planning to drink 3 or 4 juiced lemons in water, but if you are not already doing it, I recommend you swish your mouth with a pinch of baking soda in filtered water (slightly alkaline) to neutralize the lemon acid left on your teeth. One of the drawbacks of drinking that much lemon juice a day is the citric acid in the mouth can eat away at tooth enamel. It is easily remedied with an alkaline (baking soda) mouthwash.